Getting a prompt from Chrome to remove Malwarebytes. This application could prevent Chrome from working properly. Getting the same thing trying to allow for beta updates and turning off chrome sync. From what I've read on some other security software sites, Chrome recently incorporated that feature which after a crash identifies potential 3rd party software installed on the system which may be the cause of the crash. It is not identifying a definitive cause but rather just a possibility. You may have another issue with your system or its installation of Chrome which is causing the instability and it's not necessarily being caused by MB. Would you care to mention what sites they may be so I can investigate further. I hope posting this link is acceptable (some forums prohibit links to competitor sites but I don't see that in the guidelines here), I found mention of this issue on the ESET forum. Just in case others have not seen this, the Chrome freeze may be down to Windows 10. Microsoft is working to fix some device freezing and crashing issues with Google’s Chrome browser with the new Windows 10 April 2018 Update. The software maker was forced to delay rolling out its Windows 10 April 2018 Update due to Blue Screen of Death (BSOD) issues last month, and now it’s facing these fresh issues with Chrome and the “Hey Cortana” feature. 1. Try a Windows key sequence to wake the screen. If you have a keyboard connected, simultaneously press the Windows logo key + Ctrl + Shift + B. If you’re on a tablet, simultaneously press both the volume-up and volume-down buttons, three times within two seconds. If Windows is responsive, a short beep will sound and the screen will blink or dim while Windows attempts to refresh the screen. It’s surprising to see such issues with a popular third-party browser that should have been picked up in Microsoft’s testing of the Windows 10 April 2018 Update. Microsoft has 10 million people signed up to help the company test new Windows 10 updates, although it’s not clear how many actively do so. Either way, the BSOD blocking bug and Chrome freezes should ring alarm bells in Redmond over the software quality of the latest Windows 10 update. Microsoft is planning to more broadly push the update via Windows Update on May 8th, and we’ve reached out to the company to see if this is still going ahead. Thought the freezing had gone away. Interesting. I also get the request from Chrome to remove Malware Bytes ( and I've been using the pro version for several years) in the last three months. I have been ignoring it and just deleting the message and proceeding with my pedestrian little life. No crashes, no (observable much less memorable) problems with either one. I had simply presumed that it was a glitch of some sort which would straighten itself out over time, but I had no idea this was an endemic problem. I haven't had any crashes or inabilities in using either program and would be interested to hear the experiences of others in this regard. Hello frayedknotarts … that is indeed the message I get and I assume the other respondents of this thread. There appears to be no reasoning behind when it will freeze [none that I have found] … it may be 20 minutes after stating chrome or 8 hours later. I've had it when there are as many as 20 tabs open, or when there is 3. It has happened when I'm checking Gmail or when browsing the BBC website or planning a route on maps. The result is the same, chrome freezes. Downloads fail as a network error, tab switching is impossible. Sometimes if left for a while, chrome returns as if nothing had happened … this may take 10 minutes or even a couple of hours. Other times it doesn't unfreeze at all forcing the operator to resort to a restart. Upon restart it states that the browser wasn't closed properly and offers the option to 'restore' tabs. When doing so I get the added tab that displays what you posted. All very strange and I'm finding that I'm using MS Edge more and more. Did try Firefox but then was reminded why I took it off in the first place! Hope the Malwarebytes team can find a definitive solution to the issue. Thanks all, we're actually working with Google this on to figure out what's going on. It seems they have a list they look at if they've crashed, and if a program is on that list, they recommend removing it because it may have caused issues in the past. We're in talks to discuss how to make sure we can get removed from this list properly so users aren't impacted. For now, you should be able to use your computer as normal. When I tried to login the day I saw this in Chrome, the website kept telling me only employees were allowed to login, and that customers would be able to login 'soon'. I was mystified, since I wasn't even aware of there being a malwarebytes plugin/extension for Chrome, let alone ever having installed it. So, how does it feel to be on the other side now, asking to be removed from the list?????? I have the same problem. 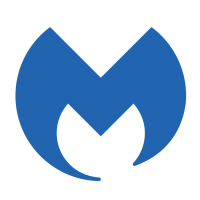 I am running Malwarebytes (Premium) version 3.5.1.2522 under Windows 10 Pro (all updates installed). I run Chrome (latest version). I have had occasional system crashes while Chrome was running; I have not tried to diagnose cause of the crashes. Every time I start Chrome, even after Chrome did NOT crash, I get a Chrome tab that reports the following: "This application could prevent Chrome from working properly. Learn how to update applications" and it identifies "Malwarebytes version 3.5.1.2522" as the only possible culprit. Except for the error message tab that keeps popping up, Chrome seems to run OK. I know that Malwarebytes security scans do not crash Chrome. I have not, and do not intend to, uninstall Malwarebytes because I value my security. Still, it would be nice to get to the bottom of this. 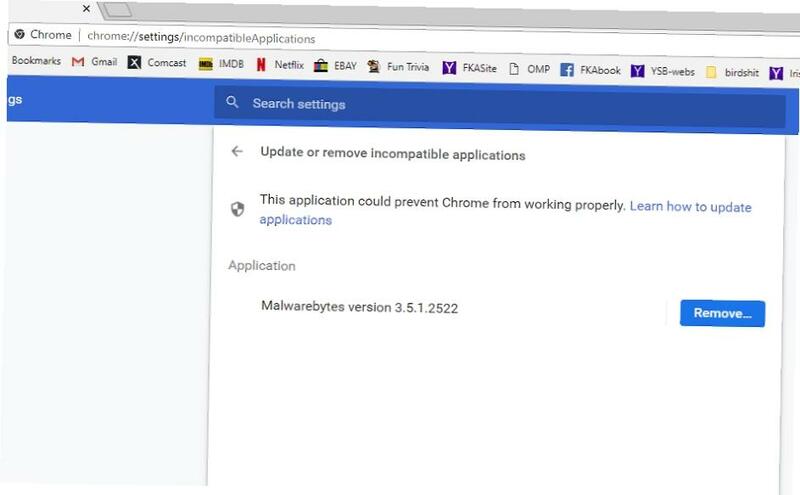 Since Chrome runs on more than a few computers that also run Malwarebytes, I expect that Malwarebytes' management would also like analyze and fix this problem. Just started happeing to my machine. Just started happening to me right after latest Windows update today at 1 pm At first it came up with a list of three programs to remove, then it reduced to one, Malwarebytes. The first list included DropBox and ScanSnap. To reduce confusion, I'm going to lock this thread and make sure this post here is the last one. At this point, there is nothing that can be done to solve this issue. We are working with Google to try and come up with a quick resolution. Once we have more information, I'll follow up in this thread. Thanks FD. Now following this thread. I read that Chrome v69 is supposed to enforce stopping apps that it now crashes once as a warning. When that happens on my desktop PC or Android, I'll switch to Firefox as my default. FF also permits extensions like the MB extension.